Much was made about Cubs GM Jed Hoyer's recent comments about decreasing ticket revenue driving the drop in spending, though some have argued that it's probably more the other way around. But whether attendance is the chicken or the egg, there's a lot more green showing in Wrigley's stands than on her outfield wall. And, apparently, in the team's coffers. At a capacity of just over 41,000, Wrigley Field sits at 21st overall among MLB parks, just one spot above its South-side rival, which boasts about 40,600 seats. So far in this young season, according to ESPN, the Cubs have managed to squeeze about 31,200 fans (9th in MLB) into the ballpark for each game, which comes out to 76% of capacity (7th), or thereabouts. Of course, you need to take that figure with a very large grain of salt, as it's derived from paid attendance. I have a sneaking suspicion that if you actually took a headcount in, say, the 2nd inning, you'd come up with a number well south of 30K. And if you sent the census-takers back out in the 7th? Maybe we're at 50% by that time. I think there were more gulls than gals in the bleachers on Tuesday night when the game ended. The White Sox, on the other hand, have never been known to draw huge crowds, and US Cellular doesn't have the tourist destination status of its counterpark. In fact, the Pale Hose rank above only Cleveland in terms of both average attendance (17,120, 29th in MLB) and and % of capacity (42.2, 29th). Yes, unseasonably cold weather and the timing of the early schedule have hurt, but that's still pretty weak. But temps are finally getting back to normal as Chiberia thaws, and one would think that the vaunted Crosstown Cup would fire up the two respective fanbases enough to crush their attendance averages. Unfortunately, that hasn't really been the case. Maybe it's because the 4-game series is lacking a sponsor after the three-year contract with BP expired. Or perhaps it's because both teams' play has resembled an oil spill in recent years. To be fair, at least the Sox offense is kinda fun to watch, particularly their cadre of Cuban defectors; somewhere there's a joke in here about overcoming Castro. 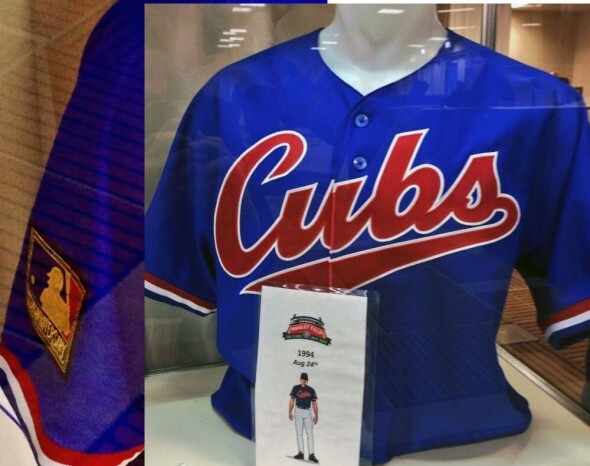 How fitting would it have been for the Cubs to move up the timeline and bust out the 90's "Cuba" jerseys for one of these games though (they're currently scheduled for Aug. 24th vs. Baltimore Orioles; TICKETS STILL AVAILABLE!)? Okay, where was I? Yes, back to attendance. The reported figures for Monday and Tuesday at Wrigley were 33,146 and 34,305, whopping spikes of 6 and 10%, respectively. And Jed says attendance is an issue; pssht. I just hope Pat and Ron were within 2,000 of the actual attendance so that Lucille from Elgin and Carl from Crystal Lake were winners in the Binny's Beverage Depot Attendance Game, thus receiving a pair of tickets to a future 2014 Cubs home game (valued at $28). Wait a minute: $28 for 2 tickets? C'mon, Binny's, surely you can do better that that. Hey, congratulations, you win 2 tickets in the upper corner of Section 538; we hope you don't have any issues with making the climb. But I digress. No small portion of those reported Wrigley crowds was wearing black and white during the first two games of what has become more punchline than punchout. But if you thought the crowds on the North Side were weak for this matchup, you were surely surprised at the lack of inmates at The Cell on Wednesday. Second serious question: were there more Sox fans at Wrigley than there are at Cell? Just in case you're wondering, and I'm sure you are, my first question addressed the ability to eschew the DH in favor of letting your pitcher bat in an AL game. I understand that it'd be a slap in the face to whomever would be filling that slot, but hasn't Ryan Kalish embarrassed himself enough already. At least he alone can feel the indignation of being passed over in the lineup for Travis Wood, rather than have millions of fans feel it too. Or, better yet, keep a DH in there and have Wood bat in Darwin Barney's place. Okay, I don't think you can do that, but you have to admit that it probably wouldn't be all that bad a move. Alright, chief, get back on point. Smallest crowd in history of City Series at 21,075. Previous low was 30,282 at the Cell on June 19, 2012. Goo! I guess if you're gonna set the bar low, set it REALLY low; as in 52% of capacity. But hey, that total does represent a 23% spike over the season's average attendance thus far, so there's that. I'm going to do a little guesstimation here though, just to see if my query was more than typical social media snark. I'm going to assume that the visiting team comprised 33% of the crowd at each game, which might well be shooting low. If that's the case, the Sox averaged about 11,100 fans at Wrigley for the first two games and had about 11,300 at US Cellular. If we take the visiting fans to 40%, then there really were more Sox fans at Wrigley. I'm not sure what that means, or whether it means anything at all. Probably just a fake stat from a fake journalist who needed something to write about. But all guesses and speculation aside, it's pretty sad to see these games devolve into little more than glorified Spring Training matchups. I've been to funerals that had more life and excitement. Is it that the gimmick has worn off or because neither team has been playing all that well (though the Sox are now over .500)? Whatever the reason, I think I've got a great way to draw more fans and generate a great deal of intrigue and excitement to this "rivalry." What's that, you say? Well, yeah, having two good teams competing would be nice too, but I'm taking a different tack. You ready? Free beer! That's right. Just get a sponsor -- preferably local, but I don't know too many who are above a free cup o' suds from even the most multinational of macros -- and have them slap their name on the fake trophy that no one cares about and that's probably sitting next to the Cake Boss cake and a pile of Ron Santo memorabilia as we speak. Then they give out free booze to the fans of the winning team for each game. You can't tell me that promotion wouldn't draw some people to the old ball game. And it might help to, you know, schedule these games for some weekend dates. I know that's some crazy talk right there, but I think it just might help. In all seriousness though, this series just isn't something that I can get excited for under the current circumstances, and I'm clearly not alone. Actually, it looked like Ricky Renteria was getting a little fired up last night. Either that, or he was just as tired of watching the game as the rest of us and was looking for a plausible way to avoid the last few innings. Well played, Ricky. What about you? Do you think this matchup has lost its luster, either temporarily or permanently? Do you have any thoughts on how to change/fix it? Leave your thoughts in the comments section, that's what it's there for. We may not be on the same page, but we're in the same hymnal. I knew that things were in trouble for the series when WSCR, the flagship station, was running promos for the past two weeks that there were plenty of seats for $19 still available. Not like the old days when Sox management was raked over the coals for saying that Crosstown tickets could only be purchased as part of a package. Regardless of whether the Wrigley numbers are sales or fannies in the seats, they sure aren't the consistent 40,000 reported before the rebuilding. You also don't hear anything these days about the Cubs-operated ticket scalping operation across the street. I'm surprised they don't bring back the ghost of Ron Santo for the attendance game, as now it would take some skill. I'm sure that the bump for the Crosstown Series at Wrigley was Sox fans and whatever the Breast Cancer promotion was. WCIU didn't show too many blue shirts last night. Finally, I'm sure the fans don't care if it is the BP Cup, Marathon Oil Cup, or Jock Itch Spray Cup. Maybe they would prefer the third. Things will pick back up soon when both teams should be young and completive in next two years. These games have always attracted the angriest, drunkest, most racist, most homophobic, most "generally spoiling for a fight"ingest people in the Chicagoland area. I can only hope the depressed attendance figures mean that most of the regulars didn't survive the Polar Vortex. I took your advice and contacted your "Dr.". He told me he needed $5000 wired to free his family from the local warlord. I figured it was small price to pay for eternal happiness. He told me to go downtown to to Fulton St, and find his associate, Honeybear. If i gave her the money she would give me the spell and I would eternally happy. Needless to say, Honeybear was no sorceress. I got pinched for solicitation prostitution, my wife left me and now I have nothing but continuous burning and itching crotch. Thanks a lot. Thank you, I'm in tears now. Surely not as much as you after that awful series of events though. HELLO everyone Have you been going through a lot in your relationship lately as a result of sudden change in your spouse attitude towards you ? If "YES",the end has come to that problem that keeps you awake when you are suppose to be asleep. When people you know to be nice and caring suddenly begins to act in a cruel manner there is need to ask questions such as, what exactly is wrong with my spouse ? Is this problem spiritual ? These and many questions that would cross ones mind at some point. I was in that kind of a confused state at some point in my relationship that I felt the weight of the world was resting on my shoulder, I was abandoned by my hubby when our son was 3 weeks. He left us for no reason. Though I wasn't too sure of what exactly would make him leave us I felt it was something extra ordinary(spiritual) that must have taken place in his memory. I was asked to contact this address to get help,(jumbaherbalis@yahoo.com), as soon as I did all my problem was sorted out. I can categorically state here that the kind gesture of (jumbaherbalis@yahoo.com) . has helped me restore my family. Thanks to Dr JUMBA.